Do you suffer from dental anxiety? If so, you are definitely not alone. The good news is, there is something that you can do about it. We have summarized an ADA online article by Anita M. Mark entitled, “Coping skills for facing dental fears.” In this article, Mark discusses multiple coping strategies that you can use to combat your dental fears. Talk to the office about your anxiety. Nothing makes anxiety worse than when you keep it inside, and our office staff cannot help your anxiety if they don’t know that you are experiencing it. Anita Mark suggests that you talk to multiple office staff members to let them know of your anxiety symptoms. She advises to tell the receptionist when you book your appointment, and to tell the staff members when you arrive. Most importantly, she recommends that you talk to your dentist about what specifically makes you nervous as well as the nature of the bad experiences you have had in the past (particularly when it comes to past pain). Asking questions, says Mark, can help alleviate the fear of the unknown. That is why she recommends that you ask your dentist about the procedures you will have, and that you even ask them to explain what is happening as the treatment progresses. Agree upon a signal with your dentist to help you better communicate with them about your dental anxiety. Mark suggests that you raise your hand, for instance, to let your dentist know if you need a break during your exam or procedure. Tell your dentist about any pain. It is a big mistake, says Mark, to not tell your dentist about the pain you experience in the chair either because you are concerned about upsetting them or because you feel embarrassed to do so. That said, a larger dose of anesthetic at the beginning of treatment often works better than trying to give more once the treatment starts—so speak up about pain! Wear headphones and listen to your favorite music or audiobook, says Mark. 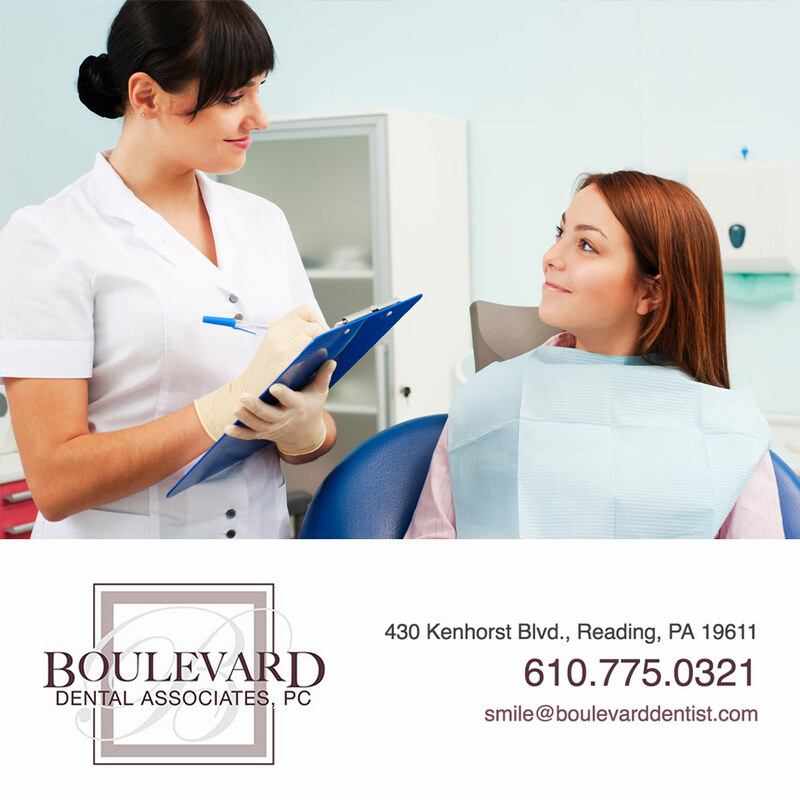 We at Boulevard Dental also use televisions, which are a great form of visual distraction. Squeeze a stress ball or play with a small object in your hands (i.e. a fidget spinner). Imagine yourself at your favorite place (i.e. the beach). Mark explains that deep breathing supplies oxygen to your body and also slows your heart rate and relaxes your muscles. She suggests that you breathe in slowly while counting to 5, then hold your breath for a second and then exhale slowly. She says to do this for at least 4 or 5 breaths (Note: She does caution that if you have a medical condition, you should talk to your doctor about whether these exercises are right for you or if they should be modified). This involves relaxing your muscles one body part at a time, starting with your head and moving down to your toes (i.e. forehead, then your cheeks, your neck and down the rest of your body). Another option Mark gives is to relax by tensing your muscles first, one muscle group at a time (i.e. tensing for 5-7 seconds and then relaxing for 20 seconds). She again cautions that if you have a medical condition, talk to your doctor first about these exercises. We at Boulevard Dental know that dental anxiety is a very real thing. We don’t take it lightly at all. We want you to speak up about any dental anxiety you experience so that you don’t have to feel alone and so that we can help coach you through the above coping techniques. We also want to accommodate you in any way that we can to make every appointment as comfortable for you as possible. We are in this with you! Mark, A. Coping skills for facing dental fears. JADA. Feb., 2017; 148 (2): 130. “https://jada.ada.org/article/S0002-8177(16)30966-7/fulltext” Accessed March 12, 2019.